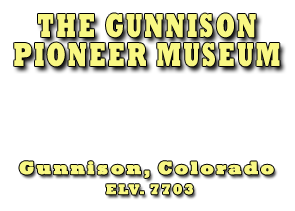 This small wooden cabin, now furnished to resemble a homesteader’s cabin, was built in the early 1900’s by Charlie Mergelman, an early Gunnison country rancher in the Iola area. Donated by the Moncrief family. This area school was built in 1919 and was used as such until 1962. 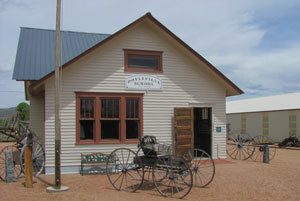 It was then used as a community building until it was moved to the Pioneer Museum in 2003. Beside school desks with inkwells, it also has law books, encyclopedias, elementary and other textbooks, a spinning wheel and clinometer. The flagpole and merry-go-round are also originally from the Doyleville School grounds. This building served as a post office for one year while the main post office was remodeled in the town of Almont. 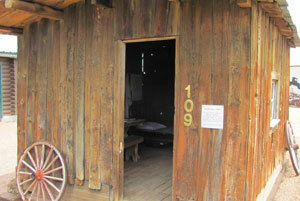 Prior to this use it was a fisherman’s cabin at Three Rivers Resort.